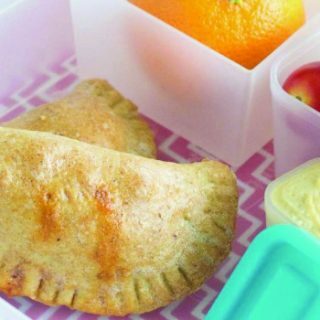 These freezable pizza pockets are a fabulous healthy lunch option! I love that you can make them ahead of time, freeze them and use them as needed. 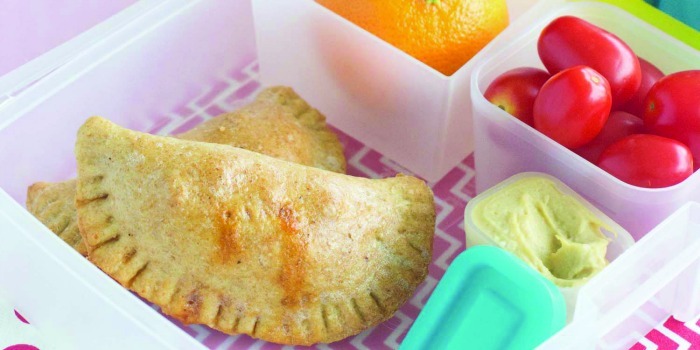 If you place one in your child’s lunchbox frozen (even with an ice pack), they will defrost by lunchtime. Just serve them with 1/4 cup cherry tomatoes, 2 tablespoons hummus and a clementine! Learn more about the program at poweryourlunchbox.com. Heat oven to 450 F. Spray large baking sheet with cooking spray. 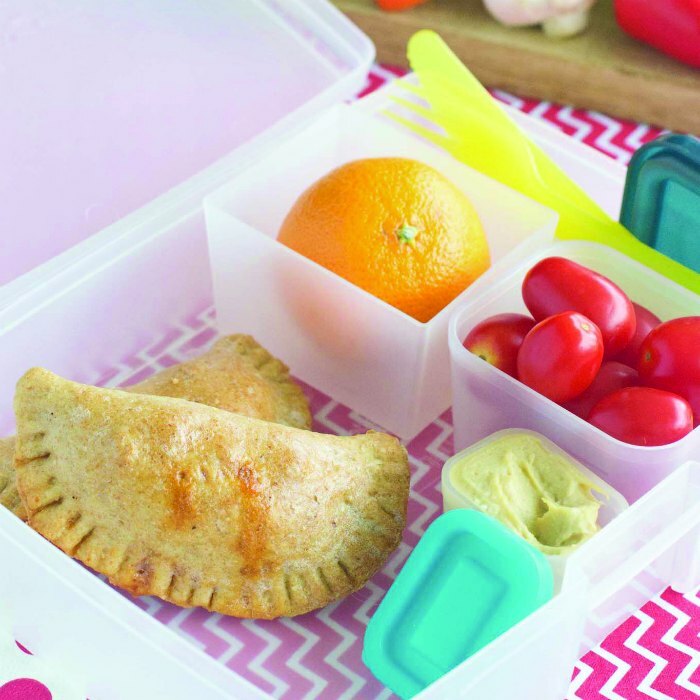 Need some lunch container ideas? Check out these affiliate links! In stand mixer with paddle attachment, combine all-purpose flour, yeast, sugar and salt. With motor running, add 2 tablespoons oil and warm water. Switch paddle attachment to dough hook. Add oat bran and mix until combined. Add whole-wheat flour a little at a time and stop when slightly sticky ball forms. Continue to run mixer 1 minute. Brush ball of dough with remaining olive oil, cover with plastic wrap and place somewhere warm to rise 1 hour. Punch down dough. Dust counter lightly with flour. Roll out half of dough to ¼-inch thick, dusting with more flour if too sticky. Use 4-inch round cookie cutter to cut rounds. Spoon 1 teaspoon tomato sauce into middle of each round. Add ½ tablespoon cheese, 4 quarters of pepperoni, mushroom slice and 2 pepper rings. Moisten edges of dough with water. Fold dough over filling and press to seal. Use fork tines to crimp and further seal edges. If placed in lunchbox frozen, even with ice pack, they will defrost by lunchtime. Serve with ¼ cup cherry tomatoes, 2 tablespoons hummus and a clementine. I love things like this. Things get so busy during the week it’s nice to have dinner or lunch already done! Thanks for sharing on the What’s for Dinner link up and don’t forget to leave a comment at the party – Next week’s features that also leave a comment get pinned and tweeted! Now that’s one I couldn’t tell you… I would think it would change the texture somewhat but you can always experiment in the kitchen. Let me know if you try it and how it comes out! I used to make these types of pockets all the time – this is a great reminder to start that up again! Have a great week! They’re just so easy to stock up on and pull out of the freezer when you need them! Wow! What an awesome idea! My hubby would love these too! The power your lunchbox program sounds fabulous… what a great cause! My grandchildren would love these. I think I will make some up like you say and freeze them. They will be perfect to have on hand when they visit. I just pinned your awesome Pizza Pockets! Hope you are having a great day and thanks so much for sharing with Full Plate Thursday. what a great idea. My husband is retired and loves having things like this to pop in the oven or microwave. Thanks for sharing at the What’s for Dinner party! 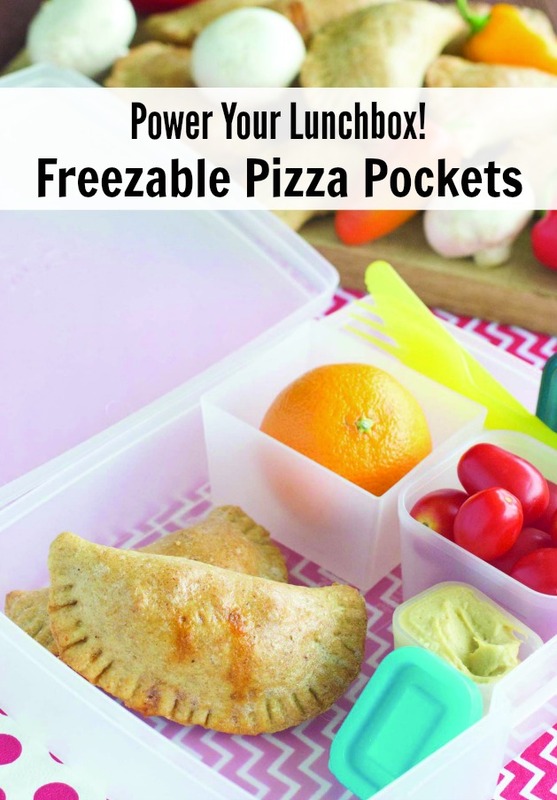 I love these pizza pockets, great for a grab N go for the whole family! Hope you are having a great week and thanks so much for sharing your post with us at Full Plate Thursday.